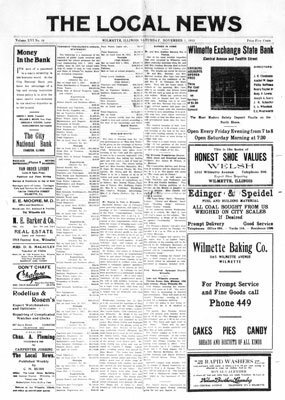 The Local News, was published weekly in Wilmette, Cook County, Illinois, U.S.A. The first publisher and editor was C.H. Rush. Later issues published by D. E. Ambrose with Ralph H. Ambrose, business manager, and Ralph H. Ambrose, managing editor. The owner was Edgar R. Morgan, 5518 Everett Avenue, Chicago.